Documentary series looking at the rail routes used by ordinary people. Rick Stein crosses Mexico from the Pacific to the Atlantic Ocean. The Cornish fish cook Rick Stein crosses Mexico from the Pacific to the Atlantic Ocean. As a young backpacker, Rick wandered all over Mexico and fell in love with the country and its hot, spicy cooking. He also worked on the railways as a tracklayer before reading English at Oxford and opening a seafood restaurant in Padstow. 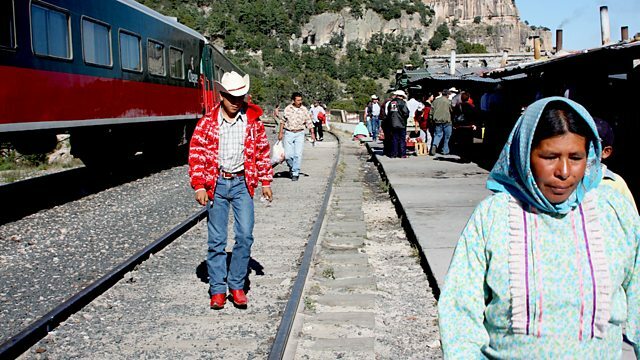 With such a background, Rick is very much at home travelling on the spectacular rail route through Copper Canyon and the Sierra Madre Mountains. With Mexico's railway in decline following privatisation, he has to be given his own private coach to complete a journey that takes him to Chihuahua, home of Pancho Villa and the Mexican revolution, Durango, where they used to make the cowboy movies he loved as a small boy, and to Mexico City where he's driven around in an Art Deco Volkswagen Beetle made out of spare parts. But what makes Mexico tick? Rick thinks it is very like his cooking - an endless improvisation. What really defines the country is its randomness, the way things seem to work without any rules or regulations.